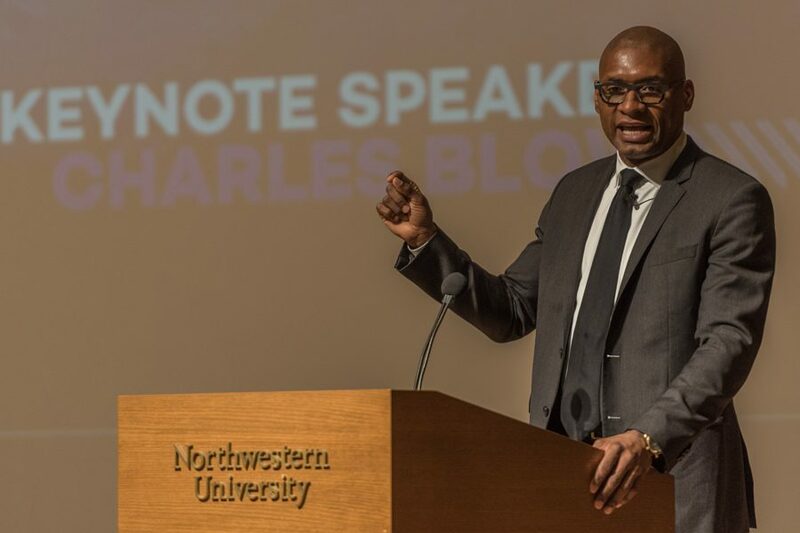 New York Times columnist Charles Blow delivers the keynote address for Northwestern’s MLK commemoration. Blow addressed issues of racial inequality and mass incarceration in his speech Thursday. If people in the U.S. want to address issues of racism, they have to focus on not only individuals, but also larger institutions such as the criminal justice system, New York Times columnist Charles Blow said at a Thursday address. Blow spoke to a crowd of about 600 people in Ryan Auditorium, including University President Morton Schapiro, about race, poverty, mass incarceration and how these issues have evolved since the time of Martin Luther King, Jr. Blow’s keynote address was part of Northwestern’s two-week commemoration of King, organized by the the Office of Institutional Diversity and Inclusion and Associated Student Government. The evening also included a performance by the NU Jazz ensemble and a benediction from Rev. Jackie Marquez, an associate University chaplain. ASG President Nehaarika Mulukutla introduced Blow. Blow said liberal cities are still profiting from “black and brown flesh” by means of mass incarceration and over-policing in predominantly black neighborhoods, which allows them to gain funds from fines and prison fees. Blow said that consequently, black families are stripped of their male family members. Throughout the U.S., nearly 600,000 black men between the ages of 25 and 54 are in prison, according to The New York Times. This means in some cities — like Ferguson, Missouri — half of the young black men are missing from the community, which has a devastating economic impact on the communities. Mass incarceration has become “the new Jim Crow,” Blow said in reference to Michelle Alexander’s book on the subject. Though King is best known for his “I Have a Dream” speech, Blow said his lesser known “The Other America” is more influential as it deals with economic inequality and its link to racism. Blow said the country must continue to work toward equal rights for all, just as King tried to achieve.